Last weekend my family took a drive out in the country. It wasn't difficult since we live in the country, but we wanted to see more of the area. So we jumped in our car and took off. At about lunch time, we stopped at an open area near a body of water and had lunch. 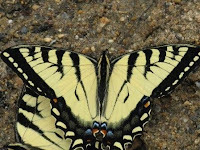 While we were there, we spotted these butterflies right near the water. . . the beauty is breathtaking. We were close enough to touch them, but we didn't want to disturb their solace so we just took photos and let them go on with their day. When I think of colors or patterns or styles for my designs, I find that many things give me the inspiration I need to move toward a design. The colors in these butterflies are inspiring. The patterning, the hints of other colors, the shaping and even the texture all plant a seed in my mind of a place to go when I next pick up my hooks, and needles for a project.